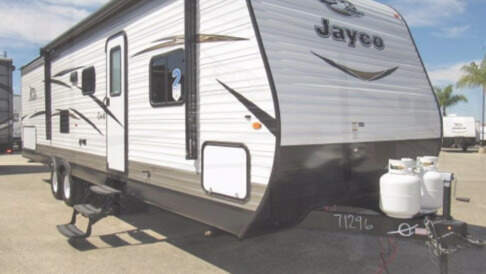 Brand new Travel Trailer with low miles. It features a semi-private bunkhouse with four bunk beds, a large slide out, and an outdoor kitchen! The main living area has a dinette, a couch, kitchen with a 3 burner stove and a microwave oven. The trailer also has a separate bedroom area with a queen-sized bed. Rates are flexible. Send me a message or request; I'm willing to work with you. Scroll down to bottom of page to see 6 month availability calendar. 3 FREE DAYS ADDED WITH WEEKLY RENTALS. 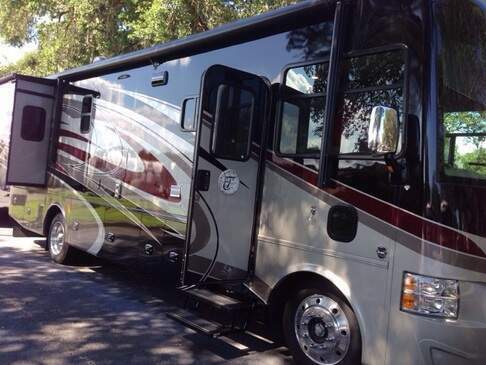 Pick it up 2 days early, get the training you need and get acquainted with the RV before your trip begins. Drive it home. Practice driving it and using its many systems. Load it with leisure. Fill the refrigerator, stock the pantry, pack the closets and load the storage compartments. $124/day. $868 Per Week ($124/DAY). $2604 Per Month. 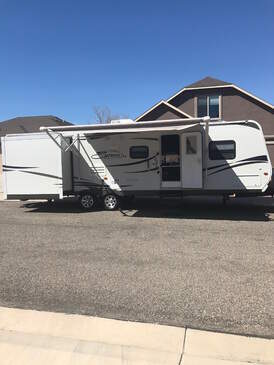 I price my RVs this way so that families going to a near by lake or campground don't pay $350 per day for a comparable RV. They don't need 200 free miles for each day of rental. True, if you want to go to Yellowstone, your over all daily average will be higher than $124/day. Don't be lazy, do the math. I promise to give you a better deal than anyone else with a comparable RV. We will Gladly Deliver the RV to you for a Fee, and include the price in your Quote. 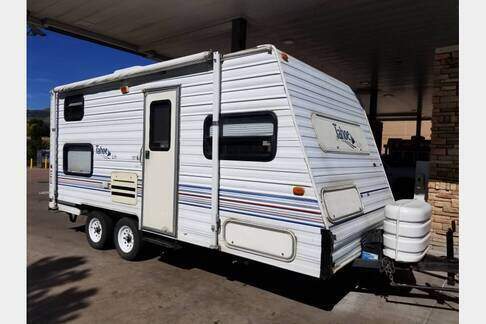 1999 Coleman Sea Pine pop up camper, new air conditioner, new tires and rims, sleeps 6 people. Very easy to set up, Pulls behind my truck very smooth, like it's not even there. Why stay in a motel, when you can stay outdoors in a camper. One bed pulls out to a king size bed, other end pulls out to a double, then 2 smaller beds in between. Lots of fun, has an outdoor stove hook up to make breakfast, or dinner, furnished with pots, pans, plates, silverware, glasses, cups. Just bring your own sheets, pillows and blankets. We are a family from a small town in Germany that many years ago fell in love with the USA and its beauty. We realized early on that a Motorhome offers the ideal platform for exploring such a massive land. 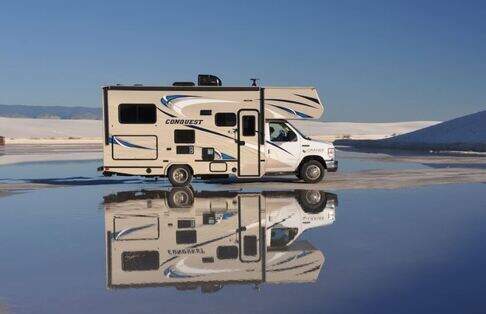 After coming stateside year after year and renting motorhomes from the “big guys” we learned a thing or two of how we could be more successful at renting motorhomes. While making many beautiful memories along the way, most importantly however, through many not so pleasant experiences, we learned what NOT to do. We will assist you wherever you want, give you a travel proposal that includes the most beautiful campgrounds, your wishes individually taken into account and enriched with many of our tips. Also for all major cities that you encounter on the way (San Francisco, Los Angeles, San Diego, Las Vegas, etc.) we have detailed workouts for what you can do, inquire about the areas and attractions and have fun at the same time. When the start of the holiday then comes closer we have already established a good contact with each other. You travel much more relaxed, because you know that you have a personal contact on the side, which you can reach at any time during the journey. Not only in the case of an emergency, but also simply for questions and advice. We even give you our personal mobile number so that you can reach us during the travel time to 24 hours a day. For 2018 we offer a brand new fleet of 2019 Gulfstream Class C RVs. We are very happy with those RVs and the space and quality they offer. We place enormous emphasis on the fact that our units are always spotless and in perfect condition. We have developed a comprehensive system of checks that we use to thoroughly check every unit before and after every rental to ensure absolute quality and mechanical soundness. The motorhomes are characterized by high-quality materials and additional extras and equipment based on our travel experiences and our customers’ responds. With 24 ft length the 6237 is almost 6 feet smaller then its big brother but is due to its intelligent floorplan in no way inferior to the 6280. Therefore you get a very convenient and manageable RV, even for first-timers but also with space easily enough for up to five people. The sleeping area can easily be separated with a curtain and offers a lot of storage space above the comfortable double bed. Since we always want to offer our customers something more, we equipped each of our motorhomes with a higher quality mattress, so you can sleep comfortably, even on vacation! In this motorhome, the bathroom is located to save space on the right side in the rear. With the additional window in the very back, the motorhome appears spacious and open. The bathroom has a large shower and a sink with a cabinet attached below. Additional storage space is provided by a generously sized mirror cabinet. The kitchen with the high-quality stainless steel sink, the large work surface and an additional fold-out workspace offers enough space to comfortably prepare a delicious dinner. It has a large fridge with separate freezer, includes a three-burner gas hob, an oven and a microwave. With a rental you will receive a full equipped kitchen, with sharp knives and a complete set of high quality table ware (for sure no plastic!) Thus, no wishes remain open. The large u-shape-dinette can easily be converted into a comfortable bed, so you are easily able to travel with up to 5 people because two full sleeps are available in the overhead, which is very spacious and also high enough for adults. The overhead in this motorhome is the highest you may get, so you have enough room to go upstairs and not the feeling of sleeping right under the ceiling. What you additionally get with us: More storage space in the alcove: Since we know that storage space in the motorhome is always in short supply, we got an additional wall unit which offers additional storage space, maybe for the large selection of towels every customer receives from us (11 per person!). In addition to the (chassis) starter battery, two large living space batteries are available so you may live without recharging for at least some days. An Onan-Power-Generator is additionally installed, which can be conveniently started from the interior by pressing a button. Of course, the RV has all the usual things, such as hot water boiler, a roof air conditioning, and huge tanks. In addition, we have also ordered a black tank flush, with which you can flush the toilet tank if necessary. The floor in the entire motorhome is made of insensitive and easy-care plastic, so no stain-sensitive carpet. This motorhome has a large and from two sides easily accessible outdoor storage space, where your entire luggage will find enough space. All our campers are equipped with electric windows, electric and heated mirrors, remote-controlled central locking in the cab and even a rear view camera. 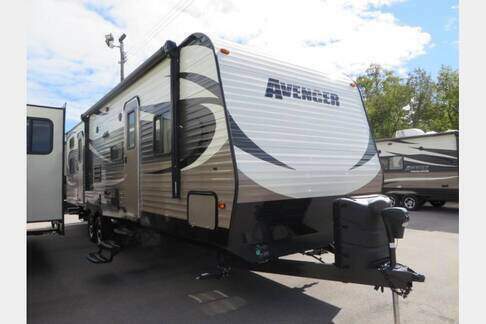 Despite the stately length, it will help you to keep an overview, even on narrow campgrounds. The audio system has a touch screen, a Bluetooth- and a USB-port. Of course, for a trip through the southwest you cannot miss an electric awning that can be extended and retracted at the push of a button. Last but not least - we hope it will never be used - but we also thought of a spare wheel. Even if you do not change it on your own, it saves you from having to rely on windy repair shops, exorbitant prices for tires or even delivery times. 32 foot travel trailer clean and taken care of with 2 slide outs, one in the living room, the other in the back bedroom. The trailer sleeps 7. There is a bunk bed in the back, each twin size, and a pull out twin size trundle bed. We had a partition installed when we bought it to provide the back room some privacy if needed. The couch pulls out into a bed, and the dining table can also be made into a bed. The front bedroom can sleep two, with plenty of storage around and underneath the bed. The kitchen has plenty of storage with full length pantry, five cup coffee maker, three burner stove/oven, microwave and double porcelain sink, refrigerator/freezer. The bathroom has a tub/shower unit, and a corner sink with storage. -HD TV with CD/Blu-ray DVD playerAM/FM radio, with surround sound. -40 gallon fresh water tank. 60 gallon grey water tank, and 32 gallon black water tank. 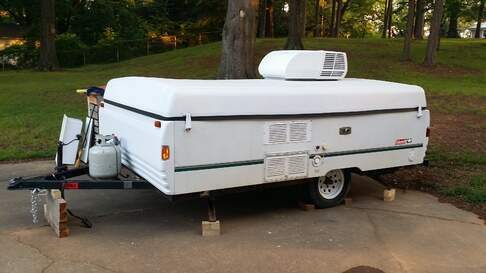 -Has a bbq that mounts to the outside of the trailer and connects to the trailers propane. Hitch for small atv or motorcycle trailer is mounted on the rear of the trailer. Camper must be cleaned and Emptied of the Grey & Black water tanks before return date. Fee of $50/each for us to clean and empty will be taken out of your Security Deposit. Generator can be included for $15/day. Additional charge after that. It is not a quiet run generator, just a standard generator. Kitchen Supplies include pans, napkins, plastic plates, plastic silverware, cups, disposable coffee cups, and shish kabob skewers. Please provide your own bath, beach towels, linens, as well as sleeping bags and pillows. ** NO SMOKING. If you smoke in the trailer, you will forfeit your deposit. **Due to my summer work schedule, I am out of town most of the week, and am not able to deliver/pickup until except on Saturday's until midday Sundays, except around Grand Junction and within roughly 50 miles. If you are needing it delivered/picked up, contact me and let me know where and when so I can see if I am able to make it happen. Thanks. Excellent class A. This vehicle is from a private owner. Our Camper is a home away from home. It has 3 TV's central air, heat, sleeps 10, a jumbo shaped dinette seats 8 and it has an outdoor kitchen. It has one jumbo slide on it that will provide you an open floor plan. This is the way to go camping. My family loves our camper and it is our pride and joy, and we want you to experience it too. This lightweight 20' travel trailer has everything you need for a get away. It comes with a sway bar for easy and stable towing. We've lived in it for as long as a month and a half with two adults very comfortably. It has an RV queen bed on one end and a large 4 person dinette on the other end that doubles as a converted RV queen bed too. You can fit two people in each bed comfortably. There is a kitchen with fridge, two burner stove, microwave/convection oven/broiler, sink, cabinets, drawers, and a top of the line after market Multipure water filter that allows you to drink the cold water directly out of the sink. It also has on demand hot water in the sink, as well as shower. The kitchen is a pop out, everything is water tight and works immaculately. There is a working toilet and black water tank, as well as grey and fresh water tanks for their respective functions There are gauges to indicate water levels and when it's time to empty black or grey, or fill fresh, in addition to a battery gauge to lets you know when it's time to plug in. 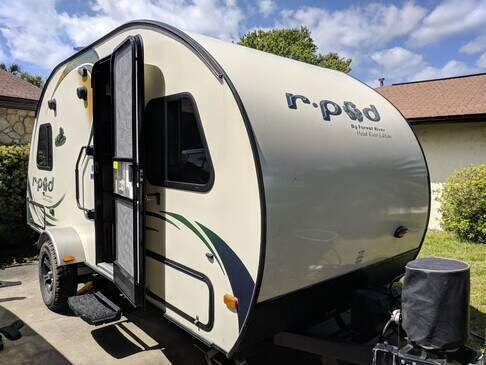 It comes with an R-Dome, which is basically a bug proof awning/screen tent room that attaches to the front door side of the R-Pod and doubles your living space. You can use it as a dining area or a tent to sleep in or for whatever you might need sanctuary from bugs and weather. It plugs into 30 amp and we have the converter to 50 amp if you need to do that. It comes with a back up battery that you can swap out for the on board one of it gets used up and you can't plug in to electric for some reason. It has working heat and AC, screened windows and an exhaust fan in the bathroom for airflow. Lots of storage compartments outside. Really easy to use and to tow. When we purchased this Rpod it was our first experience with towing a trailer and we had no problems and felt very comfortable. It is small enough to get anywhere your vehicle can get (especially with the sway bar) and big enough to be a blast to live in for a cozy adventure.